The Healthy Exchange Project aims to educate customers as well as our farmers on the types of nutrition benefits and incentive coupons available to make fresh food accessible and affordable at GrowNYC’s food program sites. The Supplemental Nutrition Assistance Program (SNAP) is a federal program that helps low-income households purchase food. Customers access their SNAP benefits using an Electronic Benefit Transfer (EBT) card. SNAP/EBT can be used to purchase any edible item at the market including fruits, vegetables, meat, fish, dairy, and baked goods. SNAP/EBT cannot be used to purchase alcohol, hot foods, or non-edible items. SNAP/EBT is now accepted at all Greenmarket, Youthmarket and Fresh Food Box locations locations. At Greenmarket, customers can visit the market information tent to swipe their SNAP/EBT card in exchange for wooden tokens that can be spent at the market. To learn more about how to apply for SNAP, contact your local SNAP enrollment center. Farmers markets across the country offer incentives to shoppers who use SNAPto purchase local food, but it all started here in NYC over ten years ago. Health Bucks are $2 coupons sponsored by the New York City Department of Health and Mental Hygiene that can be used to purchase fresh fruits and vegetables at all NYC farmers markets. For every $5 spent at farmers markets using SNAP, shoppers receive a $2 Health Buck. This increase of 40% in buying power stretches a SNAP budget and encourages shoppers to spend more of their monthly food assistance allotment on fresh produce from the market. Receive a $2 Health Bucks for every $5 spent using your SNAP/EBT card at all Greenmarket and Youthmarket locations. Health Bucks are accepted at all Greenmarket, Youthmarket and Fresh Food Box locations for the purchase of fresh fruits and vegetables. The New York State Farmers Market Nutrition Program (FMNP) is a federally funded and state administered program created to provide fresh fruits and vegetables to WIC participants and low-income seniors. FMNP distributes $4 checks to eligible seniors and WIC participants for the purchase of fresh fruits and vegetables at farmers markets. FMNP checks are accepted at all Greenmarket and Youthmarket locations. To learn more about how to apply for FMNP, contact your local Senior center or WIC center. The Special Supplemental Nutrition Program for Women, Infants and Children (WIC) provides federal grants to states for supplemental foods, health care referrals, and nutrition education for low income women who are pregnant or have small children and are found to be at nutritional risk. To offer foods that are lower in fat, higher in fiber, and more culturally appropriate, there was a refinement to the WIC food package in 2009. One of the changes made was to offer more fruits and vegetables through monthly Vegetable and Fruit checks. These checks are distributed in increments of $4, $8, $11, and $17. Checks can be used to purchase fresh, frozen and canned vegetables and fruits. Since the summer of 2009, these checks can be redeemed for fresh fruits and vegetables at participating farmers markets in New York State. WIC Vegetable and Fruit Checks are accepted by select Greenmarket producers. To find out which farmers accept these checks, contact Greenmarket. To learn more about how to apply for WIC Fruit and Vegetable checks, contact your local WIC center. FreshConnect Coupons are $2 coupons that can be used at farmers markets in New York State to purchase any SNAP eligible item. In New York City, FreshConnect Coupons are distributed to military veterans, servicemembers and members of their family at Division of Veterans’ Affairs offices. FreshConnect coupons are accepted at all Greenmarket, Youthmarket and Fresh Food Box locations. To learn more about how to apply for Fresh Connect coupons, contact your local Veterans Affair office or visit the Fresh Connect website. Greenmarket Bucks are $2 coupons can be purchased by businesses, community-based organizations and non-profit organizations as incentives or rewards to clients, employees or specific community groups. They are not available to individuals for purchase as gift certificates. Greenmarket Bucks are intended to introduce new customers to the fresh foods available at farmers markets as well as increase revenue for producers. Greenmarket Bucks come in two varieties: one for any product, another for fruits and vegetables only. This allows partners the flexibility to choose the type of incentive that is right for their program. Sponsorship opportunities are available! GrowNYC distributes Greenmarket Bucks to participants in our youth and adult education programs. Through these programs, GrowNYC provides nutrition education and interactive market tours to thousands of participants each year. Program donations are graciously accepted in any amount and we also offer special Sponsorship Packages. For more information about purchasing Greenmarket Bucks, contact Greenmarket or visit this page on our website. Greenmarket Bucks are accepted at all Greenmarket, Youthmarket and Fresh Food Box locations. 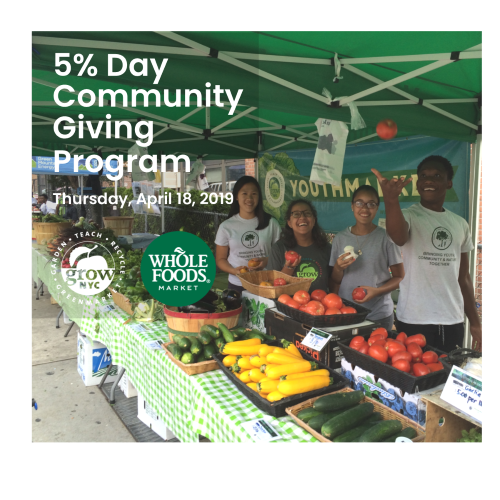 Please join GrowNYC for the Whole Foods 5% Day Community Giving Program on Thursday, April 18. Our network of farmers markets, Youthmarkets, Fresh Food Box pick-ups, and Greenmarket Co. ensures that all New Yorkers have access to the freshest, healthiest local food. We blanket the five boroughs with resources like textile and food scrap collection, Stop 'N' Swaps, and free training to make waste reduction easy for all. We build and rejuvenate community & school gardens in all 5 boroughs, and support even more gardens through volunteer days, technical assistance, school garden grants, & more. We foster future environmental stewards by providing 66,000 children each year with programs that provide meaningful interactions with the natural environment.